I'm linking up with Bonnie for another Faith Barista Jam. The topic for this month is restoring soul rest. What a timely topic this is for me. Wouldn't it be nice if we could take a vacation from our problems? Greg and I laugh each time we watch the movie "What About Bob?" with Bill Murray. If you've never seen this movie, it's worth renting. Laughter is good for emotional rest you know. I'd like to take that vacation and stay in this beautiful ocean front setting, wouldn't you? I'm sure I'd get lots of emotional rest here. But the reality is that I can't take a literal vacation from my problems. They have this annoying habit of not really going away, no matter where I stay. As I go through this difficult season in my life, the emotions of fear and anxiety can easily take over. But as the name of my blog says, I have Heart Choices to make. You see, I may not get to chose all of the circumstances in my life but ...I can choose how I respond. I choose to trust that God sees and knows all the details of my life. I cast all my cares upon Him. I choose to recognize and act upon those Divine appointments as I stay close to the Lord. I choose an attitude of gratitude as I look for the many simple blessings God has provided for me. I choose to not only study the Bible but I obey it. I choose to be a vessel of God's as I share His love with others; sometimes with words. I know I could add more to this list. But how about you? How do you experience emotional rest? Someday, like today, I visit my favorite bloggers to get both inspiration and rest. You are such a treasure and a gift! I love you! Those are such beautiful, godly choices, Debbie. You are always such a wonderful example to me. I love this! No the coastal retreat wouldn't cure problems, but I think it may help a little dont you!? :) I think if we manage ourselves, God manages the rest. As long as our eyes are fixed on Jesus, the problems seem "strangely dim!" Glad to be a new follower!! I heard a pastor once say: We need to live in daytight compartments; not borrowing from yesterday or tomorrow. I like that. It keeps me centered & focused, and so in sync with God's provision for daily bread. The oceanfront room is beautiful ... God is so faithful. I think we all need a vacation from time to time. Some people at work like to brag about wonderful places they're going to see but I often wonder why they look restless despite the what they call awesome vacation. Your post made me ponder how truly "rest" is found in His presence alone, no matter where we are. No matter what is going on around us. In this troubling times around us, thank you for reminding us that we can have that "peace" that comes from the Lord. Blessings and love to you sister. Keeping you in prayers. Perfect post...resting through Him! ...in day to day life, it is so easy to stres..about the little things and big things and any thing...but it is so true when my focus is on Him...the things around us gets out of focus. Blessings & aloha my dear friend! You are so right Debbie! That "choose" word is a real biggie! It makes or breaks us many times. I chose to Philippians 4:6-7! But a beachfront retreat sure wouldn't hurt, either! Well a beach sure wouldn't hurt! But until then... loved your list, full of wisdom. mountains, even a few days in someof the nice resorts right around Phoenix. But truth is, can't take off everytime you need a break. Actually, sometimes when I'm alone right here in my own house, beautiful music, maybe a rainy day, and a clean house. For me, that is so restful, so comforting. I think my problems might take a vacation for a little while if I could stay in that room! :) You're so right though---location isn't really everything. Choosing God is--even if it takes baby steps to get there. when I read this, I totally understand how you're feeling. And I agree with everything you've said too. You asked us how do we find emotional rest. As I began to think about that, I remembered in music how we have a "rest". It tells the musician to take a moment and "pause." To find emotional rest, let's take a moment and pause. Reflect on God's Word, His promises, His goodness, and how far He's brought us. Pause from our worrying, and anxiety. And rest. Making heart choices is so beautiful and truly brings emotional rest. Your list is life-giving. How inspiring! It is just a day by day process for me, continuing to learn to totally lean on Him. It works every time but somehow I seem to forget at times. Wishing you a beautiful weekend! I love that movie! Makes me want to see it again. I would love to take a coastal retreat some day. But my soul only finds rest in God alone. In His Word, in knowing how much He loves and cares for me. Thank you for sharing your heart today. For me, emotional rest comes from spending a relaxing time with a friend, reading a good book, enjoying God's creation, and reading the Word. Thanks for the good reminder about choosing! You are so right when you say, we cannot choose our problems but we can choose how to respond! I loved every word of this post, Debbie. 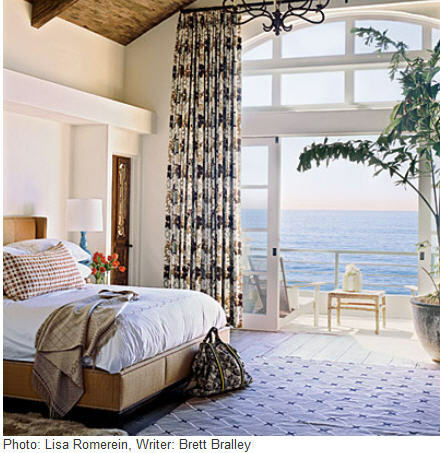 The ocean front bedroom looked so inviting. The points you outlined at the end are all so important, if we want our souls to be at peace. It's so good to know that even though we can't literally take a vacation from our problems...God will carry us through them! He gives us the strength we need! Oh I have wanted a sabbatical from my trials. We had a friend whose company provided two full months off after you worked there for eight years...I have laughed that I am more than over due that time of sabbatical...I have been on the job for 27 years, that is parenting job. The truth is I don't think people in the Bible had all the vacations we think we desire and they learned to turn to their refuge...I am learning also. Great post....it is so a choice how we react to our circumstances, isn't it?! Hey sweet sister! LOVE This post! I usually "escape" by getting out into nature . . . closer to God. I talk with Him, meditate on His Word, and absorb His peace. Many times, when I'm all alone, I sing to Him. These moments are the most precious . . . better than any modern day "vacation." They are times when I know for sure that God is with me and I simply rest in His presence. It's so powerful. I yearn and pray that He will allot me more opportunity to simply "be with Him." He is my "way of escape." I love how you write about "responding". It's been a theme in my life lately... that we should 'respond' instead of 'reacting'. Thanks for the encouragement today! May you be blessed with some soul rest this week! May the Lord refresh and renew and restore you where you need it most!